Harris, Stephen and O.a. Cooke. "Department of National Defence". The Canadian Encyclopedia, 28 June 2017, Historica Canada. https://www.thecanadianencyclopedia.ca/en/article/department-of-national-defence. Accessed 18 April 2019. The Department of National Defence was created 1 January 1923, the result of the amalgamation of the departments of Naval Services and Militia and Defence, and the Air Board. Intended primarily as an economy measure, but also to improve the co-ordination of national security policy, the formation of a single department brought the Royal Canadian Navy, the Militia (later Canadian Army) and the Canadian Air Force (later Royal Canadian Air Force) under one minister. Efforts to integrate the 3 service headquarters failed. WWII saw a major expansion and restructuring of the department. Although individual service departments were not created in law, a minister of national defence for air was appointed in May 1940 and a minister of national defence for naval services in July. In practice this meant that there were 3 separate ministries. Following demobilization, departmental organization reverted in 1946 to prewar form. In an attempt to end triplication of effort, certain support services common to all branches were integrated over the next few years, and in 1951 a chairman, chiefs of staff, was appointed to co-ordinate training and operations among the 3 services. Integration followed in 1964, when one chief of the defence staff replaced the individual service chiefs; on 1 February 1968 these 3 services were unified into the Canadian ARMED FORCES. 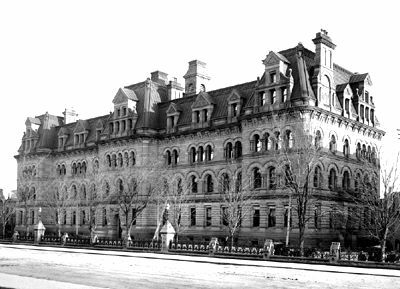 In October 1972 the civilian and military branches in Ottawa were merged into the single National Defence Headquarters. Senior appointments in DND are filled by both civilians and serving officers. The governor general, as the sovereign's representative, is commander in chief of the Canadian Armed Forces. The minister, deputy minister and chief of the defence staff (senior military adviser to the minister) are assisted by their staff at ND HQ. The vice chief of the defence staff is both head of his own division of the staff and the senior staff officer to the whole headquarters. Assistant deputy ministers may be either military or civilian. Including uniformed and civilian personnel, DND has been the largest government department since 1945, while its operating budget has consistently been among the 3 highest. Department of National Defence and the Canadian Forces The official website of the Department of National Defence and the Canadian Forces.